Pulling into a gas station to fill up after a morning spent doing errands, Oscar Grant (Michael B. Jordan) witnesses a speeding car barrels over a stray dog hanging out on the curb. Startled and enraged, he chases the car halfway down the block before turning his attentions to the victim. Looking down at the mortally wounded animal, the young man’s expression is one of compassion, but also communion. Newly unemployed and further strapped for cash after dumping a quad into the Pacific Ocean, Oscar sees in this helpless, blindsided creature an eerie portent of his own fate. Jordan, whose next-big-thing status belies the subtlety of his talent, ensures that this is a beautifully acted moment. The question is whether his excellence can redeem the pushy symbolism of the sequence, and so it goes for Fruitvale Station as a whole. Assiduously based on the true story of Oscar Grant III’s murder at the hands of BART (Bay Area Rapid Transit) officers on New Years’ Day 2009 after a fight broke out in a crowded train compartment, Ryan Coogler’s Sundance-feted debut opens with grainy cellphone footage of the incident—a veritable certificate of authenticity—and then doubles back to reconstruct the last day of its subject’s life. In doing so, the movie means to transform Grant back from a symbol of police brutality towards African-American youths—which he unmistakably became in the wake of community protests that turned into violent riots, and a court verdict that saw the officer responsible for the killing charged only with involuntary manslaughter—into a complex, fully-rounded human being. This is both a worthy and a timely aspiration, but it is the filmmakers’ overweening consciousness of that worthiness that throws Fruitvale Station off-balance. In trying to make us see that Oscar Grant was more than a statistic, Coogler unfortunately contrives to turn him into a saint. The opening credits unfold under audio of Oscar and his girlfriend Sophia (Melonie Diaz) talking about New Year’s resolutions, a clear indicator that this formerly wayward young man is trying to make a change. When the pair’s adorable daughter Tatyana (Ariana Neal) toddles into view and interrupts their nookie session, Oscar switches uncomplainingly into World’s Greatest Dad mode (which he stays in for the remainder of the movie, with the aid of some lyrical slow-mo to really hammer the point home from time to time). These early scenes briskly inventory Oscar’s flaws and foibles—his inability to hold downa job, his inflammatory temper, his criminal record—mostly so we can see how he’s trying to get them under control. 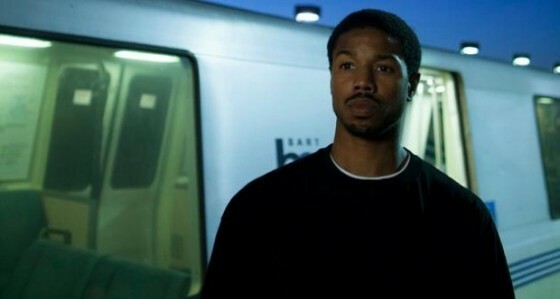 Fruitvale Station is being praised for eliding ’hood-movie clichés, but that’s not quite true: it’s more accurate to say that it introduces them more or less on cue and one after the other, so that we can marvel at Oscar’s agility in sidestepping them. A meeting with a low-end drug dealer, an encounter with a cute (white) chick at the grocery store, a confessional showdown with Sophia: all of these go better than we might expect, and, it’s implied, give us a hero worth rooting for. The deceptively peripheral character played by Ahna O’Reilly is a case in point here. Her Katie is the aforementioned Caucasian who Oscar chats up while he’s buying ingredients for a New Year’s Eve dinner at his mother’s house. When Oscar overhears Katie fretting over the best recipe for fried fish, he phones up his grandmother to supply some advice. The point of the exchange, which is too patiently developed to simply be a naturalistic longeur, is how easily Oscar melts this reluctant and slightly stunned young woman’s defenses. And sure enough, Katie’s real part in the film’s design is confirmed during the sequence in Fruitvale station, where she turns up as a passenger on the train. Having previously witnessed Oscar’s (surprising, to her) decency, she now takes up her cellphone to capture images of his death. Because the film emphasizes her presence at the end, it’s pushing us to connect her shock and horror to her (and our) earlier experience with Oscar; this outraged, camera-wielding spectator becomes a mirror for the movie’s audience, and it’s a very flattering (self-)image. It’s less certain that we’re supposed to see ourselves in Oscar, who is in nearly every shot of the movie yet remains at arm’s length throughout. Despite an awkwardly integrated flashback to his stint in prison for selling drugs, we never really get inside his head. This is definitely not Michael B. Jordan’s fault, however. Reviewing Fruitvale Station in The Hollywood Reporter, Todd McCarthy wrote that the actor (who was terrific in last year’s psycho-superhero thriller Chronicle and indelible as Wallace on The Wire) reminded him of “a young Denzel Washington.” Not only is McCarthy being lazy by choosing to so obviously compare two black actors (I guess the other option was Will Smith? ), he’s also wrong. Even in his early attention-getting roles in Cry Freedom (1987) and Glory (1989), Washington always made a conspicuous show of his gifts; Jordan, by contrast (and perhaps as a byproduct of his lengthy yeoman’s service in supporting parts) pursues more elusive effects. If Fruitvale Station stops short of canonizing Oscar Grant, it is only because Jordan is too nervy and alert an actor to permit such an easy characterization. When Oscar pleads his case with his uninterested boss and suddenly threatens him with bodily harm, it’s genuinely startling, but it doesn’t come out of nowhere, as Jordan has already suggested the deep reservoirs of anxious energy underwriting all of the character’s reflexively placating gestures— his need to smooth things over actually speaks to how wildly he’s churning inside. Where Washington’s specialty is circumspect sternness (which is why he’s dependably bad in roles that call for flamboyance, as in American Gangster  or Training Day ), Jordan does one of the hardest things an actor can do, and does it remarkably well: he can seem utterly, guilelessly delighted by his interactions with other people onscreen, such that it’s genuinely enjoyable to watch him enjoying someone else’s company. That Jordan manages to fully inhabit his dead-man-walking role and give it signs of life is undoubtedly impressive. Yet it’s also frustrating, because the star’s natural likeability ends up justifying his director’s questionable approach to the material. The infuriating facts of what happened to Oscar Grant—that an unarmed man was handcuffed, beaten, and shot in the back, in full view of an entire subway train’s worth of witnesses, no less—would have been no less so if the victim hadn’t been on a self-improvement kick, or if he hadn’t spent the previous day reckoning with his past sins. For Coogler, however, it’s not enough that Grant was innocent of any wrongdoing in the events surrounding his death; and while the intention may not be to suggest that Grant’s death was extra-tragic because he had set himself firmly on the path towards redemption, nevertheless the true crux of the issue is lost. Then there is the way that Coogler traffics in dread. Some critics were deeply offended when Gus Van Sant styled the first half of Elephant (2003) as a sort of horror-movie prelude, lining up a bevy of beautiful teenagers and emphasizing their obliviousness to the threat that he (and we) knew was lurking just down the next hallway. Those criticisms still stand, but Elephant is plainly an exercise in perspective, of Van Sant’s serene omniscience versus the tunnel vision of the characters, who are no blinder to the killer in their midst than the culprit’s own father. Elephant also problematizes the docudrama format with a variety of self-reflexive gestures: I’ve often wondered about the little interlude where the photographer slowly rotates a canister filled with emulsion fluid over and over, as if to demonstrate the process of mediation that occurs between any event and its photographic (and here cinematic) representation. By contrast, Coogler’s lingering shot late in Fruitvale Station of a deserted subway platform, held just long enough to alert us to its significance, is ominous for its own sake. Later, when Oscar’s mother (Octavia Spencer) looks at her fallen son through hospital glass and whispers through tears “I told him to take the train,” it’s a powerful moment. There’s also something shameless about it—the sort of actorly grandstanding that might be more readily called out in a movie that wasn’t based on a true story. By bracketing itself with grainy documentary sequences of Grant’s death and his memorial service, Fruitvale Station underlines the “docu” in “docudrama” and insists on its own veracity. And so any of the things in the movie that might ring false—an italicized exchange between Oscar and an older man, who tells him that there’s no time like the present to turn his life around; a scene where Tatyana complains that the New Year’s fireworks sound like gunfire and begs her daddy not to go out into the night; that damned pieta with the smooshed pooch—are effortlessly recouped in the bargain. Some have argued that the simplifications in Fruitvale Station serve a larger purpose, especially in a post-Trayvon Martin era; that whatever its flaws, the film draws attention to the way that young black men in America are summarily judged based on their appearance, and how often times those snap verdicts can prove fatal. This is all true, and, in its ownway, commendable. But it shouldn’t be sufficient for a movie to simply place itself on the side of the angels. In the case of Fruitvale Station, one might suggest the problem is that it buys into such elevated ideas in the first place. Its Oscar Grant may be a tarnished angel, but he’s an angel all the same.